On Sunday, August 16th, my sister Ruth and I went up to the United Maine Craftsmen show in Cumberland, Maine. The main reason I went was to see Leslie Muir-Volpe and her work. I want to tell you I was very impressed. Her piecing is meticulous. I can see why Bev Valle wanted me to have her on the workshop schedule. Leslie is scheduled to be at our September meeting. The topic “We’re Talking Small” will be very educational and awe inspiring. I know I am interested in perusing miniature quilts but have not as yet. The workshop is scheduled for September 19th at the Plaistow Library. I for one am excited to take this class. 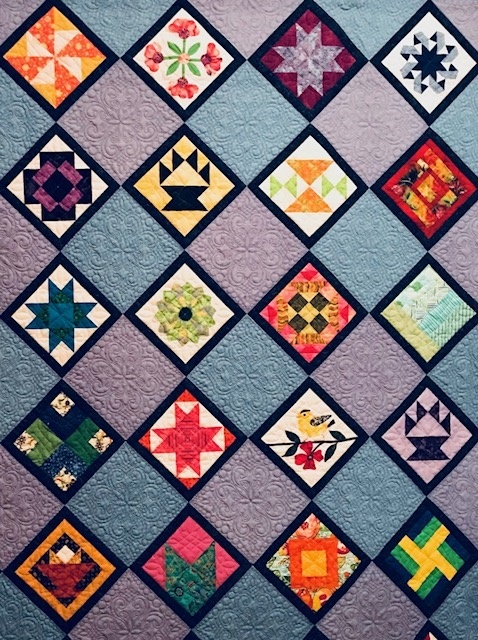 Not only do I want to make miniature quilts, I believe that the techniques taught in this class will help me to become a better piercer in larger endeavors. Don’t think you are not advanced enough to take the class. Whether you are a beginner quilter or not, you can learn how to be a better quilter. I love taking classes to polish up my skills. In the workshop, we will work on two different tops. Leslie will start us off working on a four patch in a nine patch setting. Once we have completed that we will move on to make a friendship star. Leslie feels we should be able to finish the two tops in the class with the quilting and binding to be done on our own. You can sign up at the meeting or use the Workshop Signup Form to send it in. At the moment there is space in the workshop. But I can not promise you it will stay that way. So sign up soon if you want to take the workshop. I hope to see you at the workshop. This entry was posted in Programs, Workshops and tagged Leslie Muir-Volpe, Miniature Quilts, Miniature Workshop, Quilt Workshop, September 2009 Lecture. This was a fun and very informative workshop. Robbi Joy is an excellent teacher. She is a wealth of information. I enjoyed the workshop immensely. I never thought I would enjoy fusible applique, but I did. Some of the other patterns available are just to fussy. Robbi’s don’t have all those itty bitty pieces that some have. Robbie starts everyone off making a cup. She uses the cup pattern as a technique teaching tool. Once everyone had made a tea cup, we were given the choice of nine different patterns to make. Quite a few of us chose the floral/gear designs. I found it difficult to choose from the pattern’s available. They were all interesting, with different levels of difficulty. The more intersections you had to match the more difficult it was to be accurate. The class included one pattern, any extras we paid for. I ended up with 5 patterns. It was just to difficult to choose. One of the patterns I purchased was a guitar pattern. I want to make it for my nephew. Rosemary Bray's still life in progress. For those who were interested, she show us how she made her patterns with the use of Adobe Illustrator. If you are so inclined, you can make your own patterns. I want to try to make one of my dogs. Everyone had a great time and came away with a new appreciation of fusible applique. I hope to complete my quilt by the next guild meeting. I challenged everyone to do the same. I got a lot of laughs, yeah right’s and dirty looks. I’ll probably be the only one who doesn’t completed the quilt for the next meeting. But we will see. I know Judy Hillner probably has hers done already. To see a slide show of all the pictures I took click here. If you took the class and have pictures, e-mail them to me and I’ll post them to the flickr account. This entry was posted in MVQ, Programs, Workshops and tagged Fusible Applique, Merrimack Valley, MVQ, Quilt Workshop, Robbie Joy Eklow, Workshop. This entry was posted in Quilt Show and tagged Merrimack Valley, Merrimack Valley Quilters, MVQ, Quilt Show.